This post describes how to populate Android ListView using Volley. 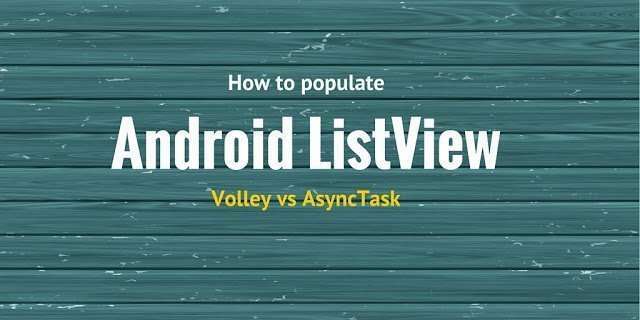 In more details, this tutorial describes how to use Android Volley to populate dynamically a ListView using JSON, and then compare it against AsycnTask. To get data, the Android app will invoke a remote service to get contact information in JSON format. and we populate the items inside a ListView.This simple example is very useful to understand Volley library and how we can integrate it. We have already covered this topic in a previous post, and this is the chance to underline the different approaches (Volley and AsyncTask). It is clear that using Volley we have less code lines to write and we don’t have to worry about handling HTTP connection. Thank you so much for this tutorial! you saved my time! Sounds like an Adapter. Perhaps a ArrayAdapter, or a BaseAdapter, SimpleAdapter, CursorAdapter, or something. But none of those seem to contain the method setItemList() so I don't know. Very useful info, can you please provide full example of this tutorial. Thanks. If the data is stored in a table in Android you could use a Cursor to read it or if it doesn’t contain many rows you could simply read the table and store them in an array. If the database is stored in a remote server you can implement a Webservice that reads it and returns the data. where did you get the “name” object , is that from json ?